Bad Company have revealed that guitarist Mick Ralphs suffered a stroke following the conclusion of the group’s recent UK tour, which wrapped up at London’s 02 Arena on October 29. 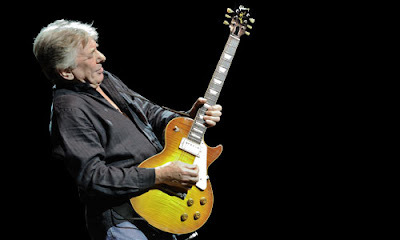 “The family and representatives of the band's co-founder, guitarist and songwriter Mick Ralphs are sad to announce that Mick has suffered a stroke,” they revealed. “Mick is receiving excellent medical care and is recovering in hospital, although all his public engagements are necessarily on hold, pending his improvement. The UK dates marked Bad Company’s first tour of their home country in four years. Ralphs sat out the group’s summer US tour with Joe Walsh this year as the band brought in former Black Crowes guitarist Rich Robinson to cover his duties. Earlier this year, Bad Company released “Live In Concert 1977 & 1979”, a 2CD set featuring two previously unreleased recordings: a 1977 show in Houston, TX and a 1979 performance at The Empire Pool in London (now known as Wembley Arena).